In Abdul Somed Jafaru, Liberty Professionals FC has signed a very interesting striker. Jafaru scored 4-6 goals for Tamale Utrecht FC during the Division One League 2011-2012, the second level of Ghanaian football, making him the top scorer of the team. After the season, the powerful striker signed a loan agreement with Tura Magic FC from Namibia, a rather “excotic” move for a footballer from Ghana. According to www.tufaghanafc.com, a source I find trustworthy, Jafaru scored two goals in 14 matches during the Namibia Premier League 2012-2013. After five matches of the GLO Premier League 2013-2014, Jafaru has yet to find the net for his new club, but based on the video link below, and articles I have read, goals should be right around the corner: http://www.youtube.com/watch?v=OOrCLg8UYdg. The picture of Jafaru was found on www.tufaghanafc.com. * Zuberu Fuseini was a sensation during the GLO Premier League 2011-2012, making a goalscoring debut for Liberty Professionals FC on 09.10.2011 against Aduana Stars FC, According to unconfirmed sources, Fuseini was 16 years old at the time. According to squad lists I have gotten through contacts in the football industry, Fuseini is born 22.12.1995, suggesting that he was only 14 when he scored his first top level goal. In any case, Fuseini made a name for himself, scoring a total of three goals during the season. The following season, the GLO Premier League 2012-2013 turned out to be a disapointment for the young Fuseini. The versatile attacker featured in less than 10 matches and failed to get on the scoresheet. Fuseini could obviously need a change of environment and it was no surprise that he decided to join Aduana Stars FC for the GLO Premier League 2013-2014. Fuseini has made a good impression during the first five matches of the season. 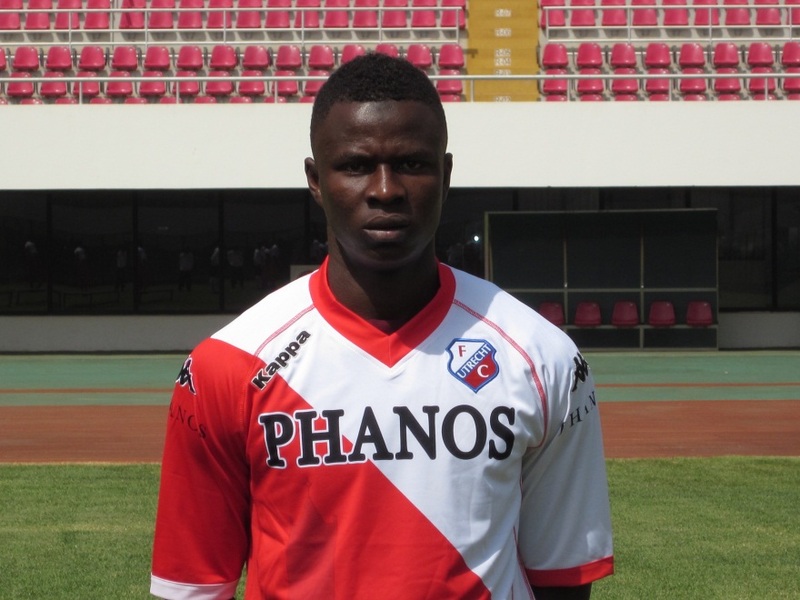 Fuseini is a hard-working player with great pace and dribbling ability. * Eric Agyemang is the highly reliable right-back of Berekum Chelsea FC. MTN Football has described Agyemang as a player with speed who is comfortable on the ball. Ghanaian football journalist Christopher Opoku has written the following about Agyemang: “Tough and tenacious in the tackle, Agyemang is also good going forward and he has also shown adaptability when deployed at left back.” From my point of view, Agyemang is one of the top right-backs in Ghana and his experience, both from the GLO Premier League and from the 2012 CAF Champions League, should make him interesting for clubs in bigger leagues. Unfortunately, there is some confusion about the age of Agyemang. According to Transfermarkt, Agyemang is born 08.07.1987. According to Egyptian website FilGoal, Agyemang is born 10.11.1985. Personally, I think 01.05.1989, taken from a registration document from the GLO Premier League 2009-2010, is the correct birthdate. * Wilson Akakpo of Berekum Chelsea FC was one of the revelations of the GLO Premier League 2012-2013. The tall, powerful centre-back made his top level debut on 24.02.2013 after some impressive performances at second level side Hot Steel FC. Akakpo formed an excellent partnership with Paul Aidoo, who had returned from Turkish second level side Güngören Belediyespor. Akakpo is a tough tackler and a rock-hard defender who was training with the Ghana B national football team after having played less than five matches in the GLO Premier League.